You know that classic combination of watermelon, feta, and mint? Yeah, I've mentioned it on here once or twice. Today I made a slight twist on it with fantastic results: still sweet and savory, juicy and creamy. But this time, instead of watermelon I used grapes. This salad is actually a great way to stay hydrated and energized during these sweaty summer months—which is so crucial for kids, as well as pregnant or breastfeeding moms. The feta cheese provides electrolytes in the forms of calcium and sodium. And the water-rich grapes provide potassium, essential to maintaining fluid and balancing those electrolytes in the body. Perfect hot-weather eatin'! Additionally, this dish provides satiety because of its balance of grain-free carbs (grapes) and protein (feta cheese). It's light but filling. Which is exactly the kind of food I love in summertime. My green grapes were humungous and my red grapes were small, so I quartered the former and halved the latter, making them similar in size; just cut your grapes to your preference. 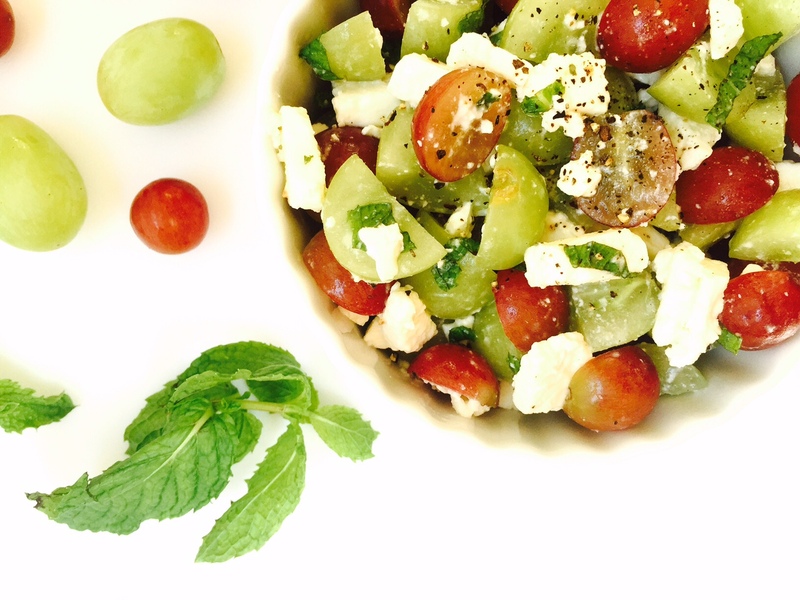 Simply toss the grapes with the mint, feta, and a squeeze of lemon or lime juice. Top with a generous amount of freshly-ground black pepper. You can add salt, if you'd like; I find that the feta adds enough salt for my taste. ...or serve as a dip with crispy crackers. The briny, creamy, juicy, herbaceous, sweet salad was wonderful with these super crunchy Naan Crisps that Stonefire sent me to try. Such a refreshing snack! This is one of those dishes that you could eat for breakfast, lunch, dinner...or even dessert. Not every salad can boast that. What's your favorite fruit-and-cheese combo? This looks so nice and refreshing for summer. I can't stand this heat, so this salad will help me cool down! Yes, it's all about staying cool on these awfully hot days! Mmmmm! What a yummy salad - loving the mint and grape. Sounds so light and delicious! Hydration is so important this time of year. People don't realize how much water they can eat. Great recipe and informative post. What a healthy and delicious looking salad! Pinned and shared! What a great salad, and I LOVE the added grapes! What a great idea! Nice! Oh how cute, I mistook those grapes for tomatoes, then realised when I read more closely! Great flavors. I love how just a bit of mint can make a dish pop. Beautiful salad. 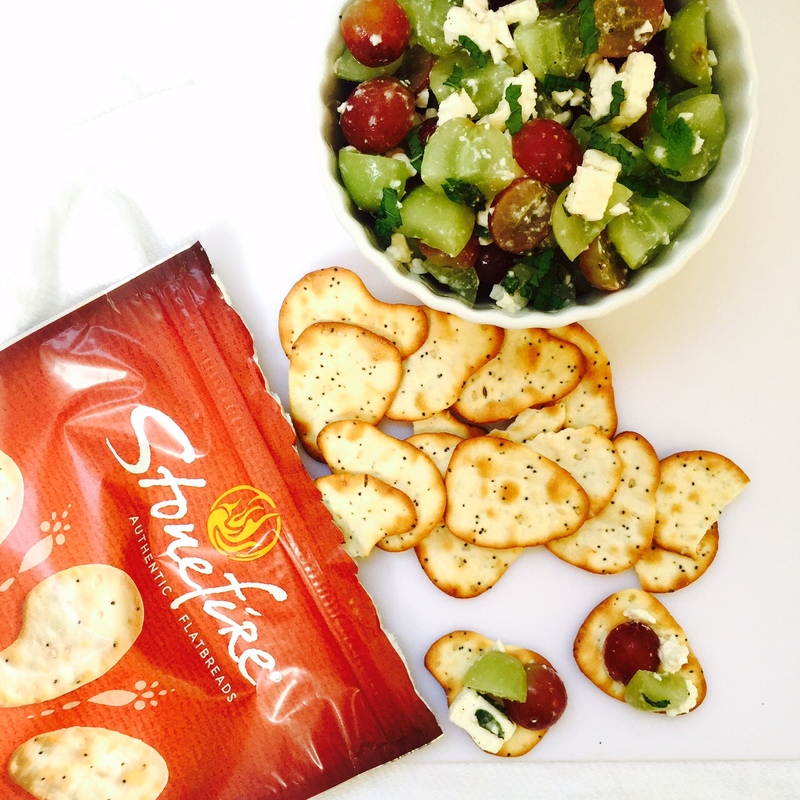 I love the added grapes. What a fresh, beautiful salad! Mint gives such a profound flavor to everything is put! I have never had grapes in a salad before though, but that looks really good. Anything with feta is good with me. 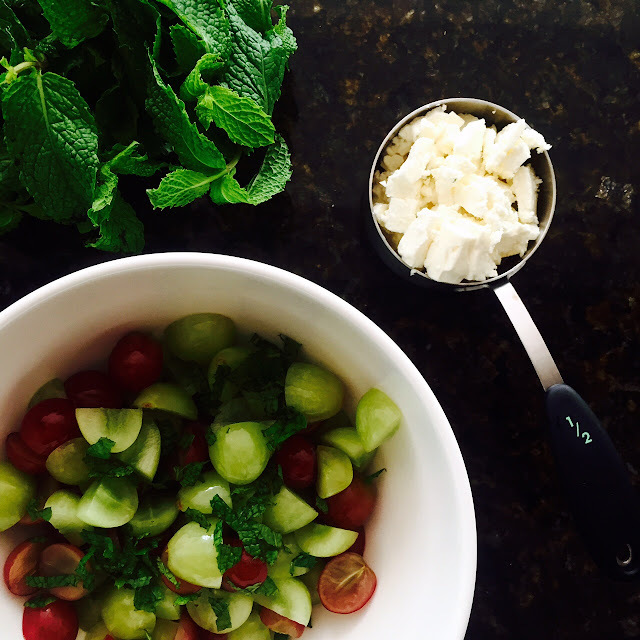 What a refreshing summer salad...and so easy to make too! 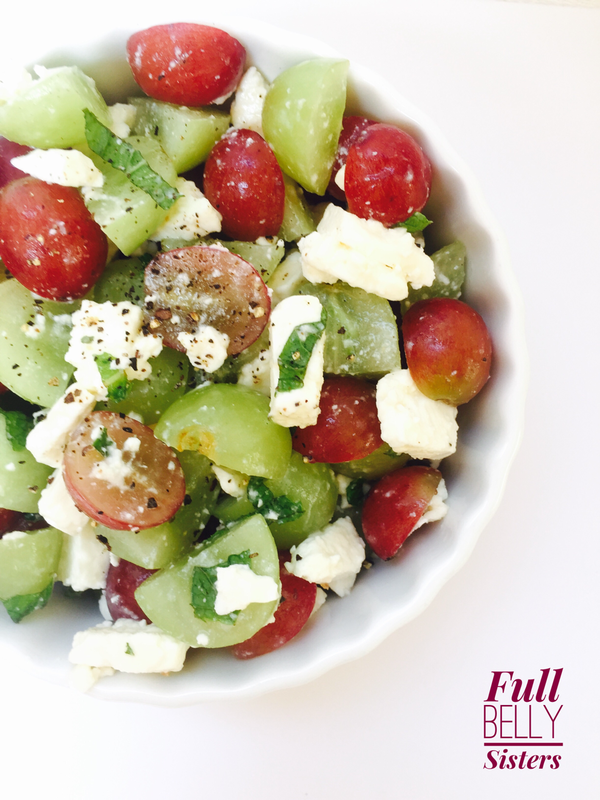 Grapes, tomatoes and feta are a great combo. This salad looks delicious! Pinned! This looks healthy and delicious! Thanks for sharing at the Say G'day Party! Pinned and look forward to seeing you on Saturday!